Pattern Review - Dimensions Gold Petite Counted Cross Stitch: Mai Believe it or not I have a back log of cross stitch projects to post! I finished this back in mid-December just before the Christmas holidays. I worked on this on and off on this project for just over a year. It was a project that I often took on work trips and to my craft group meetups. Although this is from the Dimensions Petite range (the finished project measures 5x7"), the project was fairly complex. 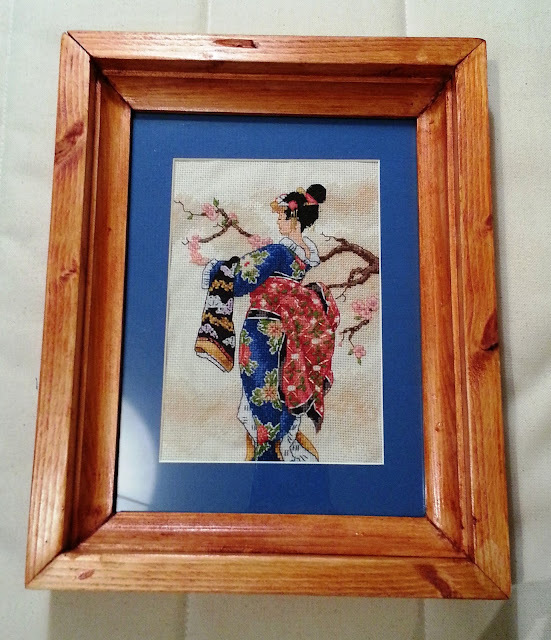 There is a large amount back-stitching to give definition to all of the details, especially the kimono. Lazy daisies and satin stitches are also featured in the design.